The wheelchair ramp configurations shown below represent a small fraction of possible layout design configurations available. In order to provide you with a commercial ramp that meets your design criteria and code requirements, online ordering for commercial ramp systems is not available. 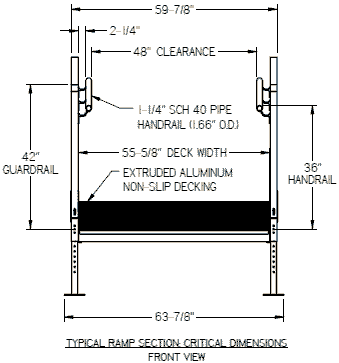 Orders for commercial ramps must involve some dialog with us to ensure that you get the product you envision. Call 1-877-258-7423 to discuss your needs and get a quote for your project. Please call us at 1-877-258-7423 to discuss your specific needs and to obtain a written quote for your project. We can help you with the design of your ramp and insure that it meets your local & federal ADA requirements at the lowest possible price.